This is a true story of exodus, the inevitable journey of the last of the First People, as they leave the Great Sand Face and head for the modern world and cultural oblivion. Paul John Myburgh spent seven years with the 'People of the Great Sand Face', a group of /Gwikwe Bushmen in the Kalahari Desert. They were years of physical and spiritual immersion into a way of life of which only an echo remains in living memory. But all does not end there. 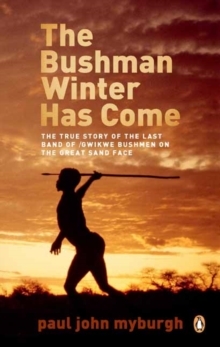 In The Bushman Winter Has Come, the author imagines a continuing journey towards a place where we may, once again, know who we are in the context of our life on this earth ...towards a time when we may answer the /Gwikwe's morning greeting, Tsamkwa/tge? (Are your eyes nicely open?) with a confident Yes.